Authenticated encryption schemes in practice have to be robust against adversaries that have access to various types of leakage, for instance decryption leakage on invalid ciphertexts (protocol leakage), or leakage on the underlying primitives (side channel leakage). 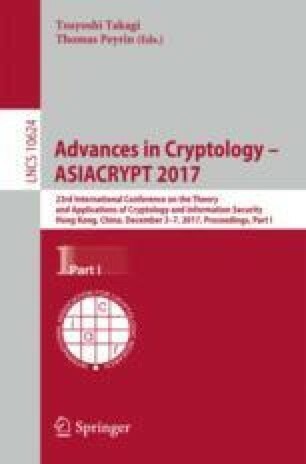 This work includes several novel contributions: we augment the notion of nonce-base authenticated encryption with the notion of continuous leakage and we prove composition results in the face of protocol and side channel leakage. Moreover, we show how to achieve authenticated encryption that is simultaneously both misuse resistant and leakage resilient, based on a sufficiently leakage resilient PRF, and finally we propose a concrete, pairing-based instantiation of the latter. Initial work was conducted while Dan Martin was employed by the Department of Computer Science, University of Bristol. Guy Barwell was supported by an EPSRC grant; Elisabeth Oswald and Dan Martin were in part supported by EPSRC via grants EP/I005226/1 (SILENT) and EP/N011635/1 (LADA).